Wealth, power, glory, success. It sounds so tempting, however, not everyone can manage to possess these things. 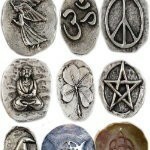 We are pleased to offer you spells and magical rituals aimed at improving these aspects of life. There are incantation, magic bindings and amulets for any purpose and any tastes. Those, who have done a lot of work, spent a lot of time finding financial prosperity, but have not achieved prosperity in this area, will be pleasantly surprised with the possibility to attract income. The earnings will flow like a river to you, profitable offers will sprinkle one after another. With our spells, you can also influence people whom you have loaned money, and they will return the cash without understanding the reason for that. Using these spells, you will be surprised with the way how money find you. Mascots in the form of bracelets and pendants not only fulfill the function of attracting good luck and prosperity, but also add zest into your image. These beautiful accessories will emphasize the individuality of yours, serving as amulets, too. The ultimate in knowing what most people don't... this enchantment is brought to you courtesy of Ash and is the way to make sure the aces are in your pocket. This enchanting piece has the spell of Blessings of Wealth. It will bring you monetary and riches rewards. It will help you find, maintain and continue to grow your money and wealth with by any possible source. This binding is an enchantment which increases the opportunities and paths of receiving all forms of money; cash, assets, property, etc. It helps you to easily recognize opportunities for profit and obtaining money, and helps you to develop the kind of quick, savvy, insightful measures you need to make smart decisions about finances. It's a great spell for anyone because it works all the time to draw money into your life. A wonderful fusion spell, this mixes the power of the Farfy to attract success & prosperity with the combination of the cleansing & rejuvenating powers of the Waif Fairy. This creates a harmonious connection where you receive cleansing & rejuvenating energies that are fueled by enchantments for power of success in all areas of your life. This is a multi-tiered enchantment that works with each of the 3 bodies individually & the 3 bodies as a collective. In working with the spells you find yourself resonating at a higher level and functioning with a greater chance of prosperity & self-fulfillment. The spells work with each body to attract the success you desire within the 3 Realms, and also provides cleansing to keep your 3 bodies clear and ready for all you wish to accomplish in your life. This binding is a mystic tool of power and spell enchantment. It is a binding of Feather Flame. Fire is a powerful element of the Earth's core power that can bring about amazing and incredible blessings in your life with true speed. A Feather Flame is a superior form of fire element, it is called a Feather Flame because of its residual effects. It is a burst of fireball power that is followed by a stream of lasting impressions that are all unique but tied to each other by the common thread of the Flame's power. 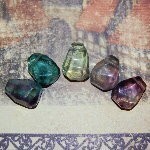 This is a really beautiful, genuine, faceted fluorite amulet with spells for success, personality, mind control, silver-tongue persuasion, charm, self-empowerment, prosperity & powerful influence over others! It is top-drilled so you can hang it, add it to another amulet configuration or enjoy it all by itself! 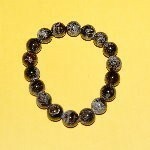 A garnet gemstone bracelet imbued with spells to Increase Connection with Spirits, Attract Wealth & Success, Increase Mystic Energy & Increase Your Psychic Power. This spell enhances the ability to gain wealth through all avenues; work, surprise, assets, borrowed money returned, etc. 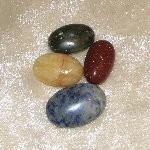 It contains a spell blend which allows you to understand more about what you want from your life, how to connect and understand more about your personal path for success, etc. You may have a steady source of opportunities, a small windfall, a large windfall, or any combination/variation of what is possible when it comes to fulfilling your dreams and desires. You will see new possibilities and paths present themselves for greater happiness. This genuine, labradorite gemstone point is imbued with 5 spells of various origin. Grecian spell for Youth, Vibrant Energy, & Beauty... Egyptian spell for Mystic Power, Revelation of Secrets, and Ancestral Communication through Dreams... Spanish spell for Good Luck, Prosperity, & Gathering of Wealth... English spell for Casting & Receiving Magic, Connecting to Magic Energy, & Communication with Spirits... and Chinese spell for Longevity of Life, Good Health, Cleansing of Body, Mind & Spirit. It's a world of possibilities with this Lemurian enchantment that brings you in close contact with the possibilities & opportunities you never dreamed existed! It's a walk in the surreal reality around you with the easy feeling of having the world on a string.